Running in Detroit, Michigan. 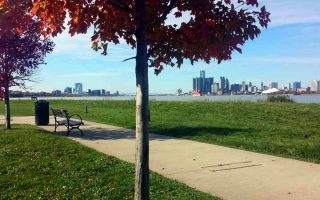 Best routes and places to run in Detroit. There is a solid and dedicated running scene in Detroit. 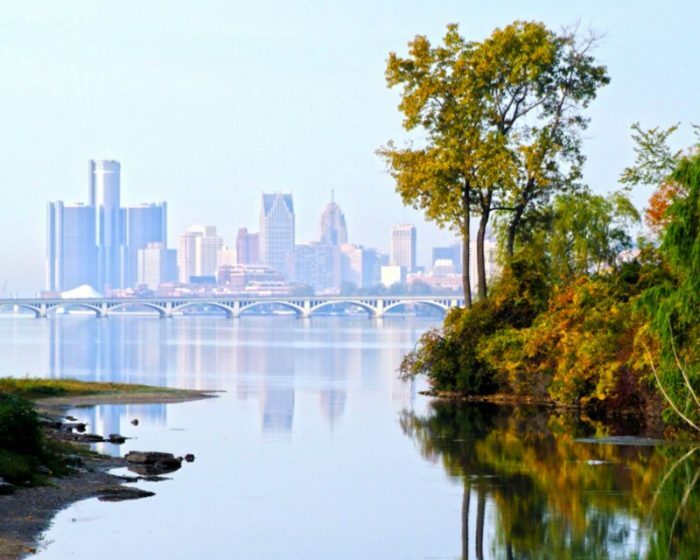 The best places to run in Detroit are wonderful Belle Isle, and the 5 mile Riverwalk trail. There are also some good neighborhoods and old ‘avenues’ that are sort of a running ‘tourist’ attraction of the city’s past, present, and future. If you have the time, head 8 miles east of the city to do a run along Lakeshore Rd. 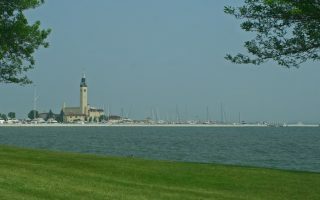 in Grosse Pointe, with beautiful water views and Detroit’s finest homes. 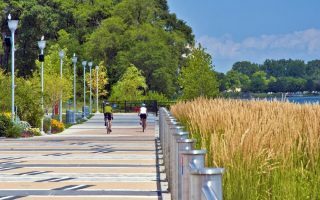 Outside of downtown, we’ve focused on the best running options in suburbs frequented by travelers: Dearborn, Farmington, Southfield, Warren, Bloomfield, and Novi. 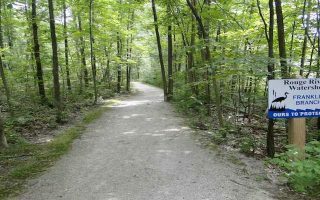 There are some several wonderful linear parks and rail trails in these areas, notably the Hines Park Trail and River Rouge Park. 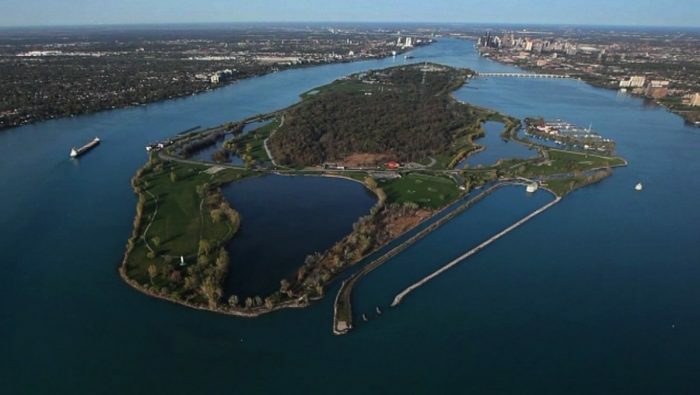 Another fun option is to run along the river paths in Windsor, Ontario. It’s just over the bridge from downtown Detroit — a five minute drive and accessed by bus (unfortunately walking across the bridge is not permitted). Stony Creek Park and Kensington Park are two great ‘destination runs’ further afield. The signature running route in Detroit, ~5 miles along the water and accessible from downtown hotels. Olmsted designed park on an island in the middle of the Detroit River, with views of the Detroit skyline & the Windsor shore. Great paths for running, including 6-mile perimeter road. 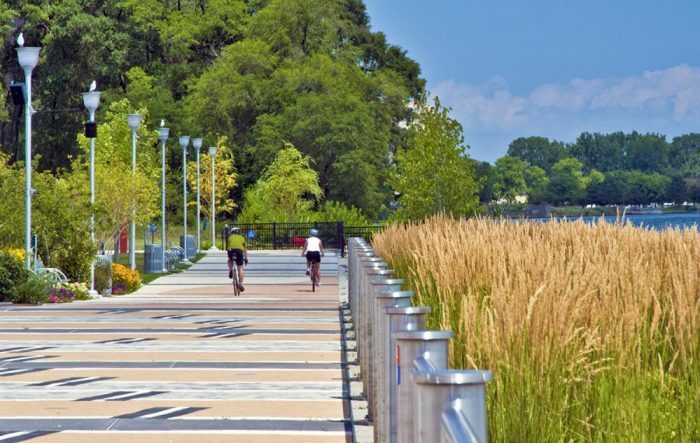 A 6-mile and 10-mile loop of Detroit’s highlights, put together by the folks at Run Detroit. Wonderful running along the lakeshore in this affluent suburb 8 miles east of downtown. Also options for some lovely residential areas. 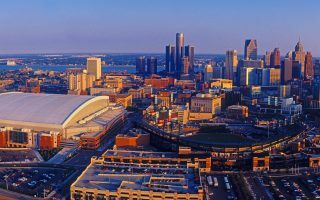 Windsor is 2 miles across the river from Detroit. Great waterfront running through beautiful parks, with interesting sites and skyline/water views. For travelers in the Dearborn (Ford HQ) and Northville areas, there are good opportunities for running. 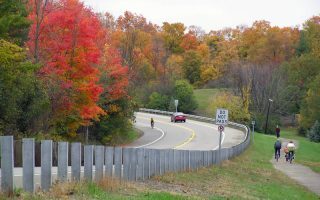 The Hines Park Trail is a paved path between Dearborn and Northville. 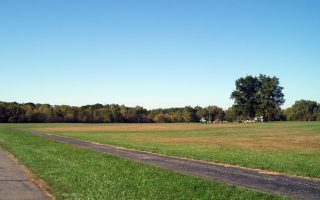 Detroit’s largest park at 1181 acres, about 14 miles west of the city, near Dearborn. 7 miles of paved trails. There’s a good 5 mile loop. Travelers might end up well north of the city, in areas such as Pontiac, West Bloomfield, Rochester. There’s an extensive series of linear parks and rail trails in these areas. Here's our guide to the best options. 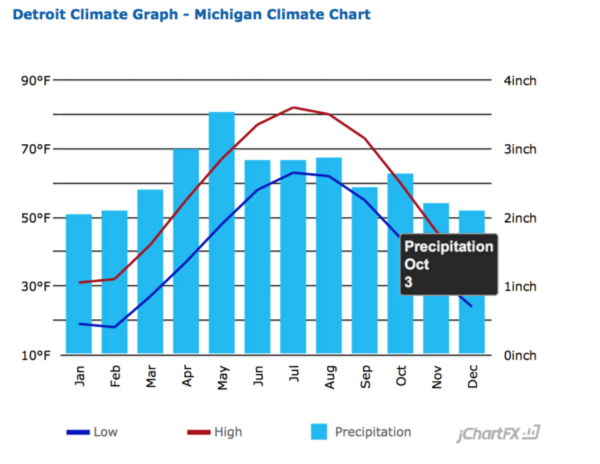 Detroit weather is typical of midwest cities such as Pittsburgh and Cleveland. Cold winters, with moderate amounts of snow, and warm, hot, and fairly humid summers. There is a good cluster of hotels downtown, in the area bound by I-375 to the east and Highway 10 the west, and I-75 to the north. They are all within 1–2 miles of the Riverwalk path, which is the best running option downtown right from your hotel. There are also hotel clusters in and near Dearborn (Ford HQ) to the east, in the Novi/Northfield and Southfield/Farmington Hills areas to the northeast, and Warren/Royal Oak to the north (GM Tech Ctr.). RunDetroit is the main indy running store downtown. They are in midtown, near Wayne State Univ. and the Detroit Institute for the Arts. Thanks to Eric for his help! Group runs Saturday 8am, with 3–6–10 mile options. Running Fit. Locations in Novi, Bloomfield Hills, Northville, Ann Arbor…and the airport!! Thanks to Jane for her help! Group Runs: Novi Store Mondays 6:30pm; Northville Store: Thursdays, 6:30pm; Bloomfield: Wednesdays, 6:30pm. Hansons Running Shop. Great local chain, very involved in the running community. Many thanks to Tom for his help! Group Runs Tuesday 6pm. Hansons Running Shop. Group Runs Thursday 6:30pm. The Running Factory. Store is about 1 mile from the riverfront trails. Detroit Free Press Marathon Some 35,000 people. Includes crossing the bridge into Canada. October. Corktown 5k. A top St. Patty’s Day race, nearly 15,000 runners. Hightale to Ale 5k. A fun event co-sponsored by Atwater Brewing Co. and Running Fit. May.